Several weeks ago I was sent some mulberry bark by a kind lady who had collected some from a fallen branch from an ancient tree and thought I might like to try it out in the dyepot. As I’ve never tried mulberry bark before, I was interested to see what sort of colours it might give. I started by leaving the bark to soak in water for a week or two and then I simmered it for about an hour, before adding some alum-mordanted and unmordanted wool fibres. I used about the same weight of fibres and bark and I kept the temperature just below a simmer, as the tannin in barks can sometimes dull the colour if the temperature is too high. 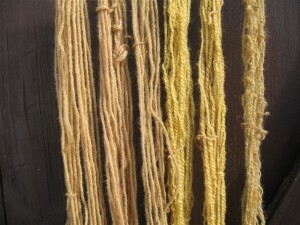 When the fibres had taken up as much colour as possible, I turned off the heat and left them to soak overnight. I then applied alkaline and iron modifiers to some of the samples. The photo below shows the colours I obtained. Some of the colours produced from the mulberry bark are more yellow in tone than the colours often obtained from barks and I was interested to see how little they reacted to the two modifiers I used. My thanks to Ann Machin for supplying the bark for this experiment. This jacket was knitted using only wool dyed with the fungus Cortinarius semisanguineus, which I obtained from Finland. The pattern is one I devised myself and the front bands have been crocheted rather than knitted. I often use crochet for edgings, partly because it gives a firm border but mainly because it’s quicker. (Yes, I know that speed is not really a valid reason for design choices and I confess to laziness at times!) 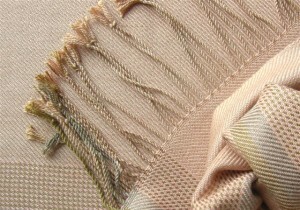 The skeins from which the upper section of the body was knitted were dyed using different modifiers to give a variegated effect. This is the reverse of the jacket. The keen-eyed viewer may notice that the colours in the upper variegated section of the back are slightly different from those on the variegated sections of the fronts and sleeves. Unfortunately I didn’t have enough of the same wool for the back, so I used a skein I bought from Leena in Finland, also dyed in Cortinarius semisanguineus. 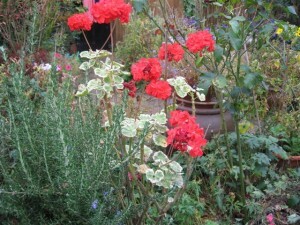 But the colours all seem to blend in well together. 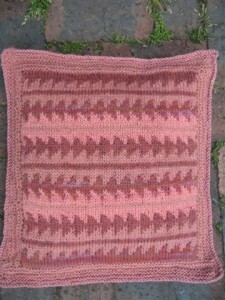 This is the first in what I plan as a series of knitted cushion-covers, dyed with various fungi. 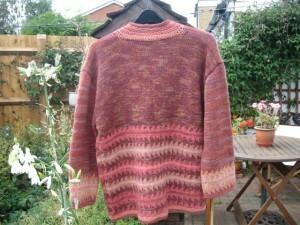 This one was dyed using what remained from the skeins dyed with Cortinarius semisanguineus, after I’d knitted my jacket. 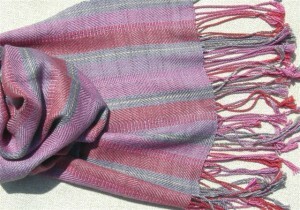 This scarf was handwoven by Maggie Stearn, using a mixture of handspun merino wool and some silk yarns, all naturally-dyed by me, using extracts of logwood, madder, fustic and cochineal. The handspun wool was so fine that I knew I’d never use it for knitting, so I commissioned Maggie to make this scarf for me, incorporating some silk yarns as well. I was thrilled with the results and love wearing this scarf. Unfortunately, the photo doesn’t do justice to the sheen and drape of the scarf, or to the subtlety of the design and colours. I have the utmost respect for the craft of handweaving and I know I would never be capable of the application and skill required to see a weaving project through from start to finish. In fact, a kind friend did set up my 2-shaft table loom for me about 30 years ago and I’m ashamed to say that I’d lost the will to live before she’d finished warping it. So I wove a couple of inches and then gave the loom away to someone who was doing some work on our outbuildings and expressed an interest in weaving. I have to say that I’ve never regretted this impulsive act as, once I’d admitted to myself that I lack the strength of character required to become a weaver, I was free to explore the delights of natural dyeing and handspinning without feeling obliged to continue weaving as well. 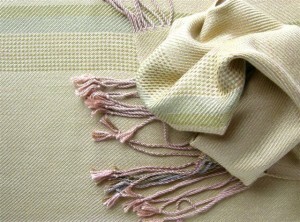 Maggie trained at Wall Hall College under the tutelage of Mike Halsey, a well-known British weaver, and started off weaving fabric lengths, usually in wool. After some years gaining more experience of the market, she decided to produce mainly silk scarves and shawls, with some cushions and bags, and all in the most beautiful colour combinations. So it was a privilege to become part of her production processes. Last year I had operations on my right arm and also on my knee, which meant I was unable to do much dyeing for Maggie, but I am now feeling fit enough to start again and looking forward to whatever colour challenges she decides to set me. Below are some more of Maggie’s scarves. 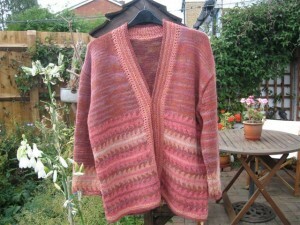 Look at her website (www.mini-webs.co.uk/maggiestearn) for details of the full range and how to order. The dyes used here are extracts of cochineal and logwood. 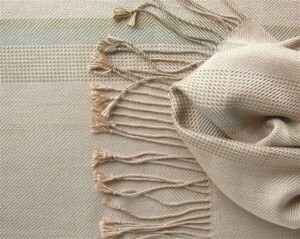 The dyes used here are extracts of rhubarb root, quebracho, wattle and walnut, with a small indigo stripe. The dyes used here are extracts of quebracho, wattle and walnut, with some fustic and indigo. 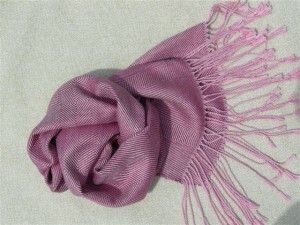 This scarf was dyed using extracts of weld, cochineal, walnut and logwood, with some indigo as well. I love the Autumn. 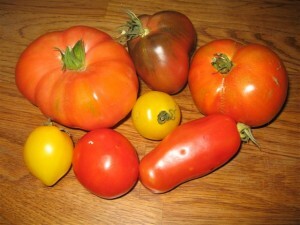 I love the final harvests of fruits and vegetables grown throughout the Summer and the feeling that the hard work earlier in the year has usually been worth all the effort. Of course there will have been failures, such as the courgettes this year, which got burnt by the sun when I left them in the closed cold frame during a brief hot spell. Or the potato crop, which was pathetic in comparison with last year’s harvest. But even the failures have their uses and teach me some important lessons. 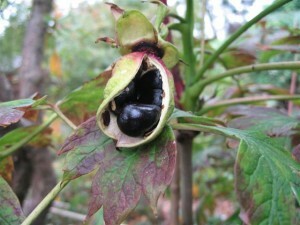 And I love the glowing Autumn colours in the flower garden and the occasional perfect rose or interesting seed pod. My dyer’s broom, rhubarb leaves and dahlia flowers and leaves have been cut, dried and stored for later use and the walnut hulls given to me by kind friends are soaking in tubs of water. However, I still have to harvest and use my woad leaves, so there are pleasures yet to come. 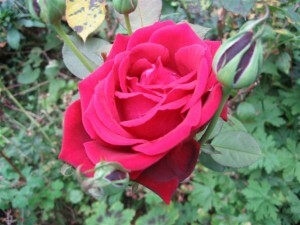 But eventually the frosts will come and strike down the remaining Summer flowers and it will be time to plant the bulbs. 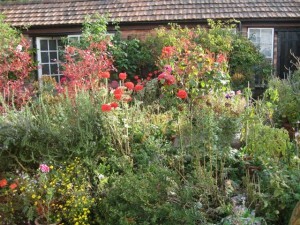 Eventually the garden will be ready for its late Autumn tidy-up. Trees need to be pruned and some plants will be divided or moved to new positions. And then finally most of the work will be done and it will be time to light the wood-burning stove and settle down in its warmth to plan for the next year. Two people have told me that they have recently been experiencing problems viewing my blog, so I wonder whether this has affected anyone else? In an attempt to improve the situation, the settings on my blog have been changed, so only six posts, instead of ten, can now be seen on the first page. This should speed up loading the site. Perhaps anyone who still has problems could let me know and give me more details, so I can try to sort things out. I was contacted a little while ago by Carol Leonard, an old friend, fellow dyer & spindle-spinning expert, who wondered if I could shed some light on an interesting result from a dahlia dyebath. Carol explained that a student on one of her spinning courses had tried a dye experiment, using dahlias that had been in the house for a few days in a vase and were past their best. She used no mordant and, she thought, an aluminium pan and the pan and the skeins (wool and mohair) had been properly cleaned. She simmered the flower heads, then put the yarns in with them. When she removed the skeins there was the faintest pink colour on them, most of which disappeared when the water was drained from them. So she put the yarns back into the pan with the flower heads, put the pan on one side and then forgot about it for a couple of weeks. During that time, mould grew on the surface, and the dyebath probably fermented. 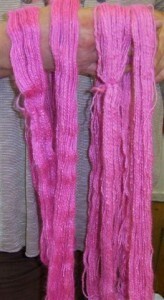 When she next looked at the skeins, they had become a bright pink. Carol wondered whether the fermentation had produced an alkaline bath, which caused the skeins to turn pink. Fermentation may certainly have played a part, although I would have thought this would make the dyebath more acidic, rather than more alkaline. (At least that’s the case in indigo fermentation vats, when washing soda has to be added from time to time to maintain an alkaline pH.) An alkaline modifier usually produces vivid orange-rust colours with dahlias, but I’ve never got a pink. However, I think one clue to this colour may lie in the fact that the dahlias were purchased from Asda supermarket. Sometimes flowers purchased from florists or supermarkets have been dyed extremely bright colours, probably to produce colour-co-ordinated bouquets. I’ve been given bunches of beautifully-arranged and brightly-coloured florist’s flowers only to discover that they had been dyed. This became clear when much of the colour came off on my hands, and also into the water, when I put the flowers into a vase. So perhaps this pink was a result of some dye on the dahlias, which then leached into the water in the dyebath. I wonder whether anyone else can offer any other suggestions as to the reasons for this fascinating and puzzling colour result? I have some pink dahlias in a vase as I write this, so when they have faded they will be destined for the dyepot. I will be interested to see whether I can get similar results from a fermentation dyebath, but I suspect I will not, as my dahlias have come directly from the garden and have most definitely not been dyed! This photo shows the wonderful pink shade from the fermented dahlia dyebath.